The life of German painter, draughtsman and etcher Friedrich August Moritz Retzsch literally spanned two centuries. Born in 1779 Retzsch died in 1857. He joined the Dresden Academy of Fine Arts in 1798 and became a professor there in 1824. The tragic play popularly known as Faust by Johann Wolfgang van Goethe (1749-1832) was first published in 1808 when Retzsch was 29. “Lot Notes” for the 1999 sale by the art auction house Christie’s of Retzsch’s famous masterpiece Die Schachspieler (The Chess Players) correctly point out that, like many artists of his generation, Retzsch held a fascination with the story of Mephistopheles and his bet with God that Faust (a man seeking to learn all that is possible to learn) could be lured away from a righteous and honorable path. For more information on the debate whether Samuel Taylor Coleridge was the individual who translated into English the Boosie and Sons excerpts of Goethe's play Faust illustrated by Retzsch, click here. Regardless of who was responsible for translating "Faust" from German into English, that first English translation of certain extracts from Faust was published by Boosie & Sons in 1821. 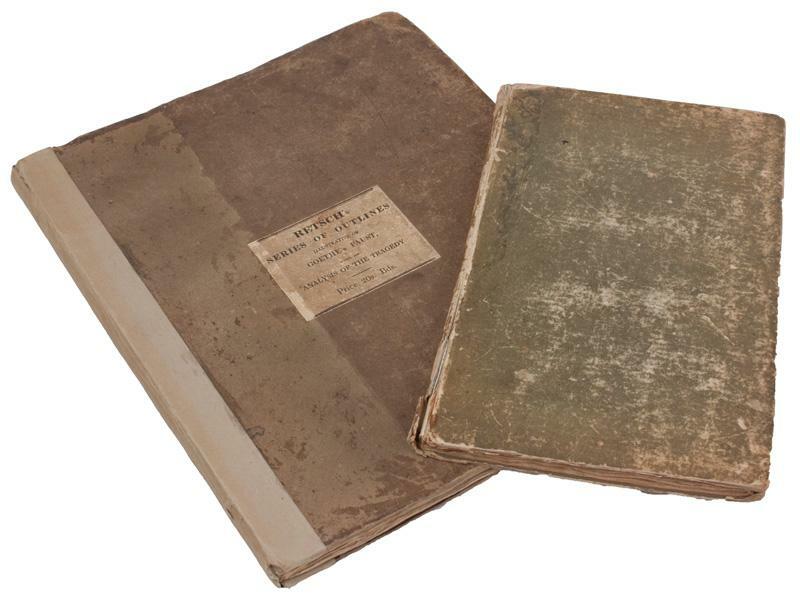 (See image of that 1821 volume below). Those English language extracts were accompanied by Retzsch’s already popular engravings of actual scenes from the first part of Faust. The early 26 engravings by Retzsch depicting certain scenes from Faust had been first printed by the German publishing firm Cotta in 1818. Retzsch’s commission by the Cotta publishing house for those engravings made him financially independent. 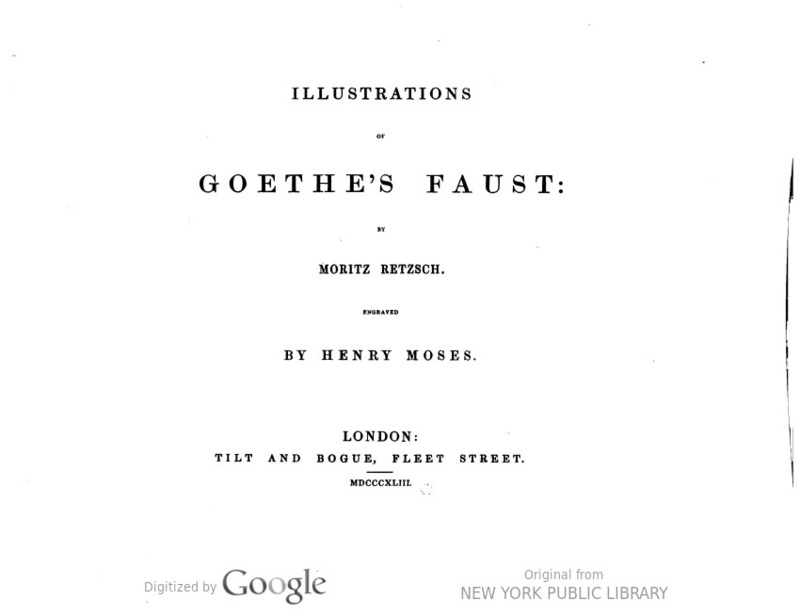 Those same early Retzsch illustrations of Goethe’s Faust engraved by Henry Moses were published again in 1843 by Tilt and Bogue, Fleet Street, London. A copy of that book (titled “Illustrations of Goethe’s Faust: by Moritz Retzsch Engraved by Henry Moses”) was given as a gift to the New York Public Library by Miss Matilda Bruce on July 27, 1908. It can be viewed on-line by clicking the image of that book's front page found below. Scrolling through that hathitrust web link to locate a particular page in the above book where Retzsch's illustrations can be found is cumbersome and time consuming. If you would prefer to view several of Retzsch's illustrations of scenes from Faust reproduced in that 1843 book click here. Moritz Retzsch Early Sketches of "The Chess Players"
It is not known exactly when Moritz Retzsch began sketching out the chess composition that eventually became his most famous painting. 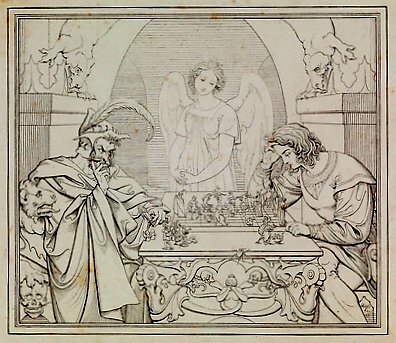 In 1831 Ernst Fleischer published what appears to be the first known print of the etching by Retzsch that bears the same title as his final painting—“Die Schachspieler-Les joueurs d’échecs-The Chess Players”. For that reason some place the painting’s date to be 1831. The original image of Ernst Fleischer’s publication can be viewed here at the Metropolitan Museum of Art web site. 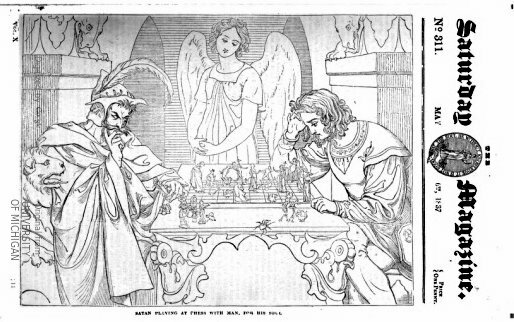 A similar reproduction of Moritz Retzsch’s early etching of the now famous game of chess between the Devil and a young man (seen below) can also be found on the web site of the chess collector Jon Crumiller. Mr. Crumiller apparently was able to collect what he describes as the first printing of a booklet consisting of four text pages and a plate apparently published in Boston six years later in 1837. Based on the 1831 date listed for the engraving found on the Metropolitan Museum of Art web site it is possible the booklet found on Mr. Crumiller’s web site may be a later reproduction or reprinting of Fleischer’s booklet six years earlier. It is interesting to note that Mr. Crumiller’s web site refers to the title of this early etching by Retzsch as either “The Chess Players” or as “The Game of Life”. It is not known when “The Game of Life” was first used instead of the official title “The Chess Players” to describe Retzsch’s composition. The Game of Life is exactly the title used by our family for our great great grandfather Anthony W. Jones’ later bronze bas relief reproduction of Retzsch’s masterful chess scene composition. On May 6th of that same year 1837 a sketch similar to be the engraving posted on-line by both Mr. Crumiller and the Metropolitan Museum of Art appeared on the front page of issue No 311 of The Saturday Magazine. See that front page below. The above front page sketch can also be viewed on-line as it appeared in the Saturday Magazine by either clicking here or on the above image. “We return with pleasure to notice the works of this gifted artist; and now present to our readers a copy of one of them, which appears to us astonishing in its conception and execution, and will, if we mistake not, become the best known of all that he has executed. Retzsch's several published outlines are familiar to us; and, although there is not a single instance of cross-shading, no colour of any kind, the interest they excite impels us to return to them again and again; and every time we look at them, we see some new beauty. So completely, indeed, do they take possession of our minds, that we forget the total absence of those incidental aids which the higher branches of the art call in to their assistance. Moritz Retzsch may have created more than one painting of his famous scene of chess with the devil. The painting sold by the Christie's auction house in 1999 is described as oil on panel measuring 12 inches x 15 & 3/8 inches (32.3 x 39 cm). That particular painting (viewed at the top of this web page) can also be viewed on Christie's web link. 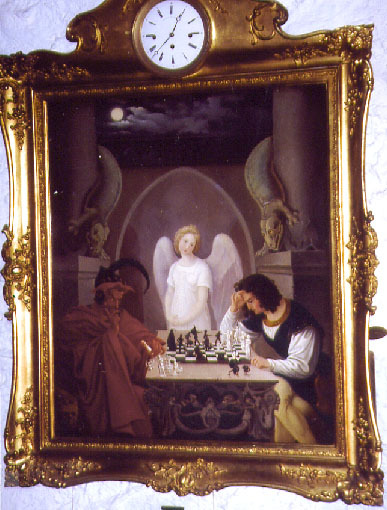 We found another copy (see below) of a much larger painting of the same chess scene in a clock frame featuring a clouded night sky and moon above both players. 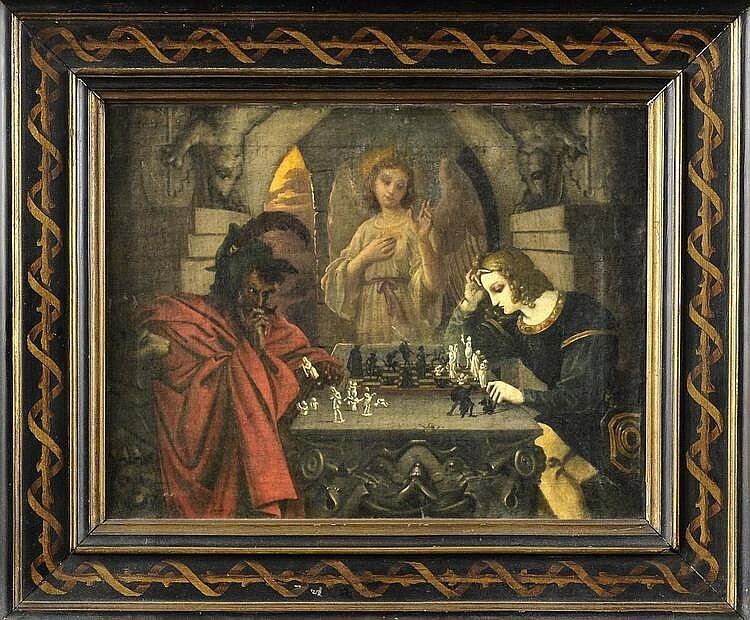 Whether it was painted by Retzsch or by another artist inspired by his famous chess scene is unknown. To view the above image on-line click either on the above image or here. It is unclear how many separate paintings of the chess players Retzsch may have created. For another slightly different version of the same chess scene, see below. Again, whether it was painted by Moritz Retzsch or by another painter inspired by his work is unknown. 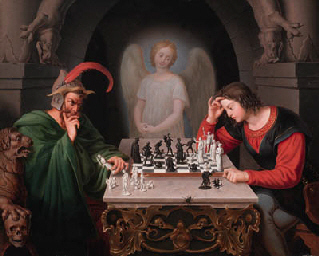 The invaluable.com web site describes the location of the chess players in the above version as “in a dark vault” in a “contemporary frame with painted Rosenzweigbordure, 38 x 29 cm.” To view this version of the chess encounter on line click on the painting above or here. We also found one last version (see below) described by the invaluable.com web site as a charcoal drawing heightened with white of “The game of life”. To view this version on-line click on the image above or here. Whether it was created by Retzsch or by a student or follower of his is unclear as the above work is described as “after Moritz Retzsch (German School)”. The face of the young man is not as soft and refined and the face and hair of the angel are rendered differently than we usually find in other sketches, engravings and paintings attributed directly to Retzsch. 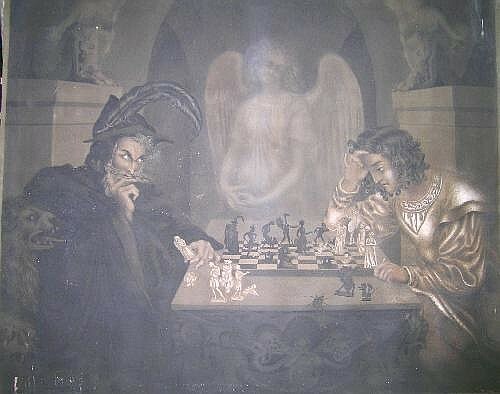 The play by Goethe contains no scene of Mephistopheles (the Devil) playing chess for Faust’s soul. 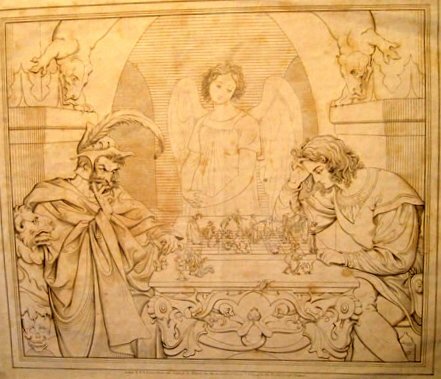 For that reason none of Moritz Retzsch’s early engravings for Goethe’s Faust recreate such a scene. However the Faustian theme and the likely dire consequences if the young man should lose his chess game with the Devil are obvious. As the Lot Notes on Christie's’ web link for the Retzsch painting sold in 1999 point out-- the chess board appears to be placed on the lid of a sarcophagus. “I saw in Retzsch’s atelier…the head of an angel smiling. He said he was often pursued by dark, haunted by melancholy forebodings, desponding over himself and his art and he resolved to create an angel for himself, which would smile upon him out of heaven.” (Christie's Lot Notes citing to Mrs Jameson, “Visits and Sketches at Home and Abroad”, London, 1834, p. 125).